Jakarta, June 25th 2014 – As one of Archipelago International's most prominent hotel brands, the maverick hotel management company is continuing to expand the famous favehotel brand to a number of new locations in Indonesia. The rapid expansion will see six new favehotel properties hit four different cities in Indonesia, including Jakarta, Cilacap, Padang and Pekanbaru. The capital city will see the opening of three new favehotels, starting with favehotel Zainul Arifin – Jakarta which is set to open by September this year. The hotel will feature 84 rooms located close to such historical landmarks as the National Museum & National Monument, and will be just 10 minutes from Gambir Train Station and 35 minutes from Soekarno Hatta International Airport. The super clean and contemporary hotel rooms will feature top of the line beds with a plush mattress, down pillows, a cozy duvet and crisp 250 thread-count sheets, together with smart touches that contribute to an even more comfortable stay. Free high speed WiFi will keep guests connected, while the eclectic café-shop will serve a simple but hearty breakfast and many light and healthy choices throughout the day. The second favehotel set for Indonesia’s capital is favehotel Pasar Minggu - Jakarta that will open within the second quarter of 2015. The 110 room hotel will be conveniently located close to Cilandak Town Square, the Pondok Indak Golf & Country Club and the Cilandak Golf Driving Range, as well as being close to the International School and Government Offices. And finally, the third favehotel to hit Jakarta will be favehotel Grogol – Jakarta, due to open within the 4th quarter of 2016. With 100 rooms, the hotel will be located close by to a number of famous malls, like Mall of Ciputra, Central Park Mall and Mall Taman Anggrek, whilst also being close to the International Soekarno Hatta Airport. 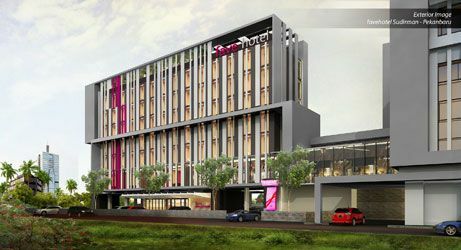 Heading south, the central Javan regency of Cilacap will see the opening of favehotel Cilacap, slated to open within the 4th quarter of 2016. The hotel will feature 120 rooms and it will be in close proximity to the area's main attractions, like the sea port and the surrounding beaches on the southern coast, as well as the ancient Dutch fortress called Benteng Pendem, which was built in 1861-1879 by the Dutch East Indies Army. Into Sumatra and the flourishing island will see the opening of two new favehotels in the 4th quarter of 2015. Padang will welcome favehotel Olo – Padang with its 100 rooms, while favehotel Sudirman – Pekanbaru will feature 110 rooms and 3 meeting rooms. In Padang, guests can enjoy easy access to all that the lively city has to offer, like Food Street Simpang Kinol, the Museum Adityawarman, Siti Nurbaya Bridge and Padang Beach. Padang is the largest city in the western coast of Sumatra and is a common transit point for surfers traveling to the Batu and Mentawai Islands. Padang beach (known as Taplau or Tapi Lauik) is well known for its beautiful sunset and hundreds of food stalls. Bungus bay to the south of Padang is suitable for swimming and boating. Located at the heart of Pekanbaru, favehotel Sudirman – Pekanbaru will be a short 10-minute drive to the Pekanbaru Mall and SKA Mall, with a two-way shuttle service available twice daily. It is also just 15-minutes from the Sultan Syarif Qasim II International Airport. Pekanbaru has been awarded on many occasions as one of the cleanest big cities in Indonesia, and it is notable for its wide main streets and large median roads. “We are currently undertaking an unprecedented period of expansion throughout Indonesia, which will see Archipelago International more than double its collection of hotels in the country over the next few years. By the end of this year alone, Archipelago International will be launching 33 new hotel projects, while 2015 is already set to open a further 37 hotels to welcome guests throughout the year.” Said Norbert Vas, Archipelago International's VP Sales & Marketing. Exterior of favehotel Sudirman – Pekanbaru. Room of favehotel Zainul Arifin - Jakarta.